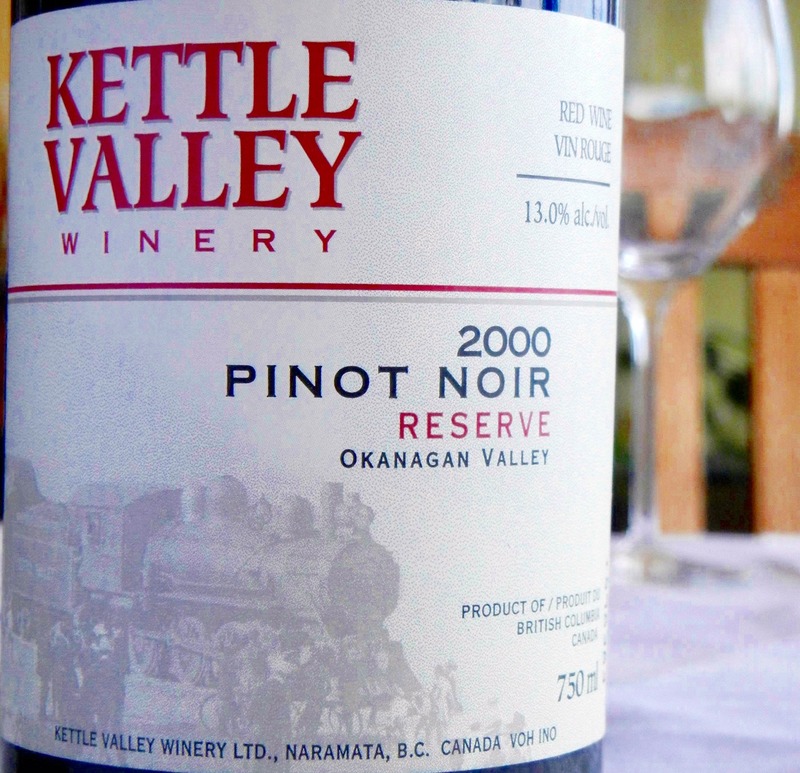 Kettle Valley Winery is one of a handful of BC wineries who have been making pinot noir for 20 vintages or so. Along with Blue Mountain Vineyards, Quails’ Gate Vineyards, Gehringer Brothers, Gray Monk and Mission Hill, they give us important points of comparison for B.C. pinot noir regarding ageability, geography and age of vines as well as the influence of winemaking styles and clonal selection. 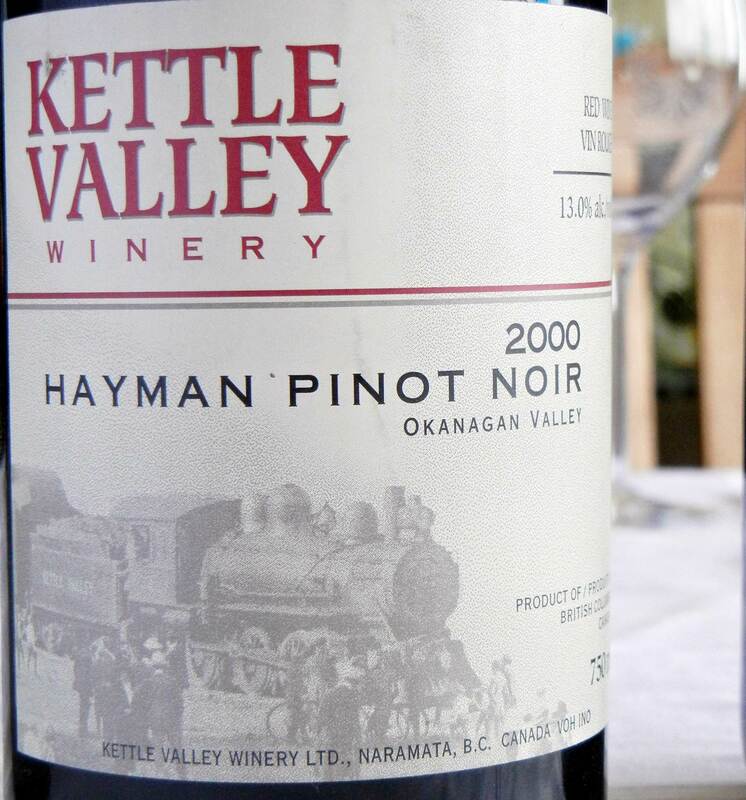 The inspiration for the winery’s name came from the Kettle Valley Railway which between 1915 and 1961 ran through Naramata where the winery is based. It connected the Southern Interior of British Columbia to the rest of the Pacific Northwest. Tim Watts and Bob Ferguson began their careers making homemade wine in Vancouver in the early 80’s. By 1984, as their passion and competence increased, they outgrew their home facilities and began looking for a bigger space and their own vineyards. They settled on land on the Naramata bench and purchased their first vineyard land in 1987, planting pinot noir and chardonnay. In 1992 they were granted the third winery license on the Naramata Bench and the twenty-third in the province. The first Kettle Valley vines were planted on the Naramata Bench in 1987 at the Crest Vineyard on Steele Road. The inaugural vintage was in 1992 when they produced 44 cases of Pinot Noir. They opened the winery’s doors to the public in 1996. 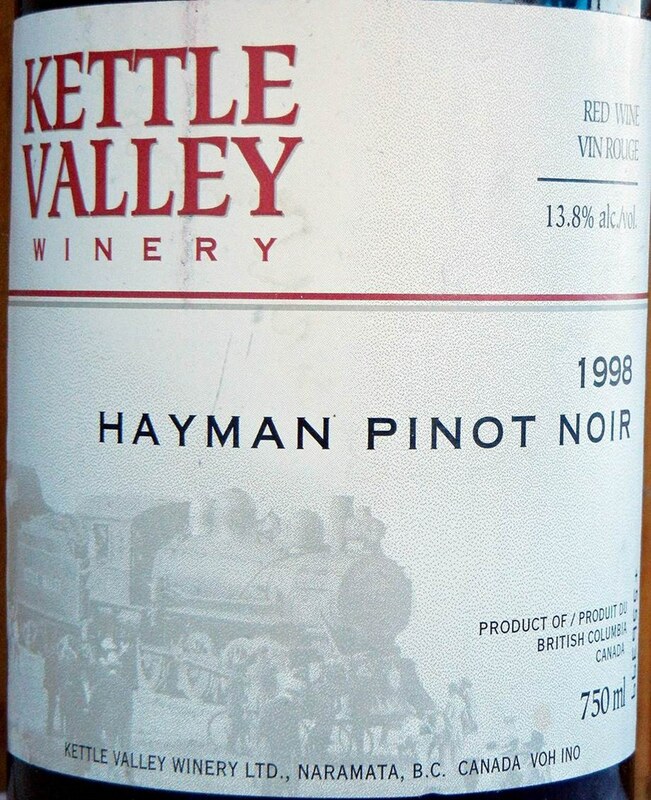 The Kettle Valleywinemaking style for their pinot noirs results in wines that have intense, fully ripe flavours, higher alcohol and generally speaking see longer barrel aging times. Hang times are often very late, with picking often occurring at the very end of October and into November. The wines are meant for long aging (10-20 years). 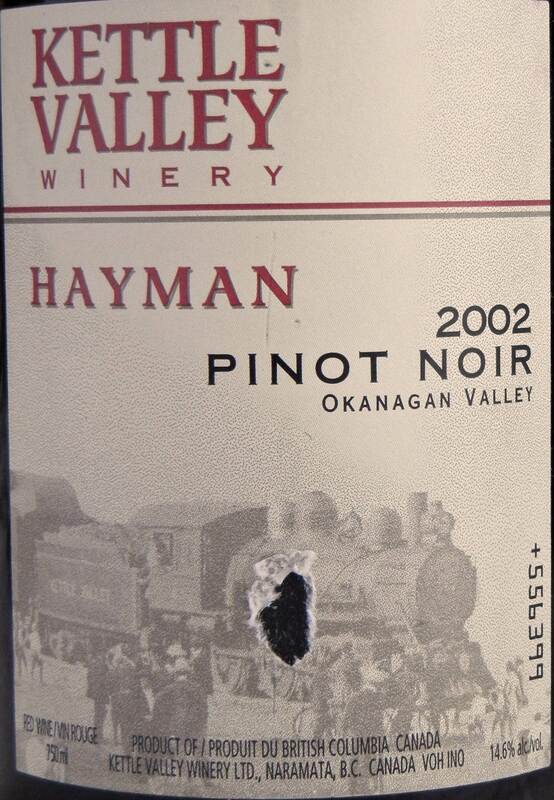 There are currently three pinot noir bottlings, a regular, a reserve and their Hayman John’s Block single vineyard (previously known as the Hayman Vineyard). 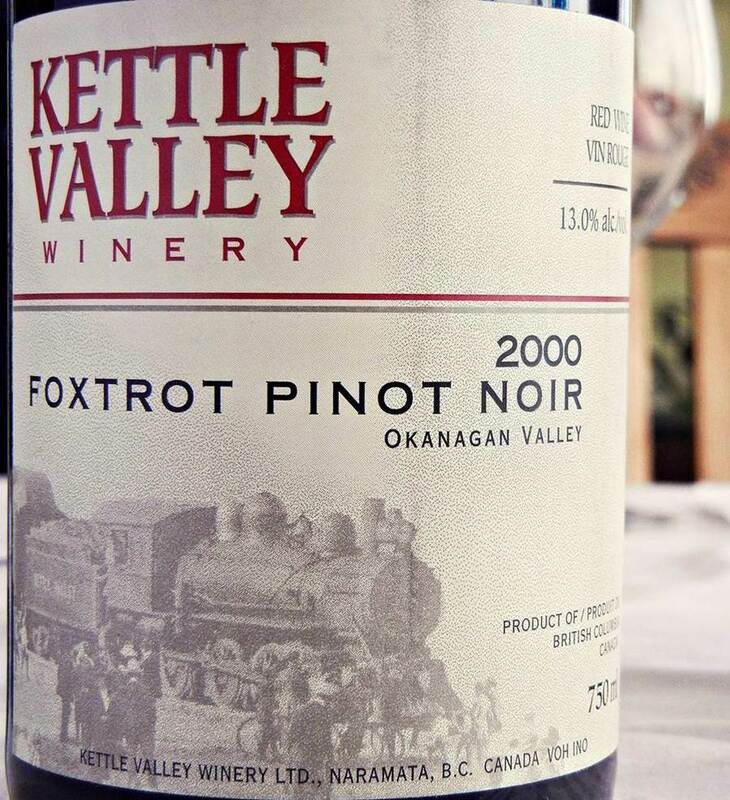 Before 2002, grapes were also sourced from the Foxtrot Vineyard. That vineyard was sold in 2002 and became the basis for a brand new winery – Foxtrot Vineyards. Grapes for their three bottlings come from a variety of vineyards that have included the Crest, Cole, Hayman and Trovao vineyards in Naramata, the Lazy Dog and Spagnuolo vineyards in Penticton, the Thibault vineyard in Summerland and the Elgert vineyard in Okanagan Falls. The wines for this tasting were generously provided by Lee Cross, Jacquelin George and Ron Simpson. Note that all closures in this tasting were cork. LC: Red, garnet, dense. BG: Medium pale, bricky rim. AKG: Cherry/garnet, rich colour, not too glossy, slightly cloudy EU: Dark garnet. Jacquelin G: Slightly cloudy, medium garnet/bricky, core of rim, showing age. LC: Briar, strawberry, forest floor. Mushroom, barnyard, hints of anise, eucalyptus note after 15 minutes. BG: Roses and cherries with depth, truffle, earth – raspberries! AKG: Liquorice, roses, dried cherries, wet leaves, cigar. EU: Strawberry Jell-O. Jacquelin G: Lots of roasted beets, some gamey stew, dried fruits, slightly hot. LC: Complex. Medium/long finish. Quite good balance. Mint/cinnamon. Sweet with good balance. BG: Short, intense, bit hot, herbal cherry. Doesn’t match nose. Dried out fruit, soft textured, earthy, mushroom. AKG: Intense and rich flavours, mellow fruit, tannins have some bite but in a blunt powerful way rather than a sharp way, savoury notes dominate. EU: Intense dry tannins, slight bitterness, cranberry, strawberry but fruit emerged later. Jacquelin G: Medium body, generous acidity, dried fruits, medium plus finish that lingers pleasantly. Drink now would be good with mushroom risotto and/or asparagus risotto. 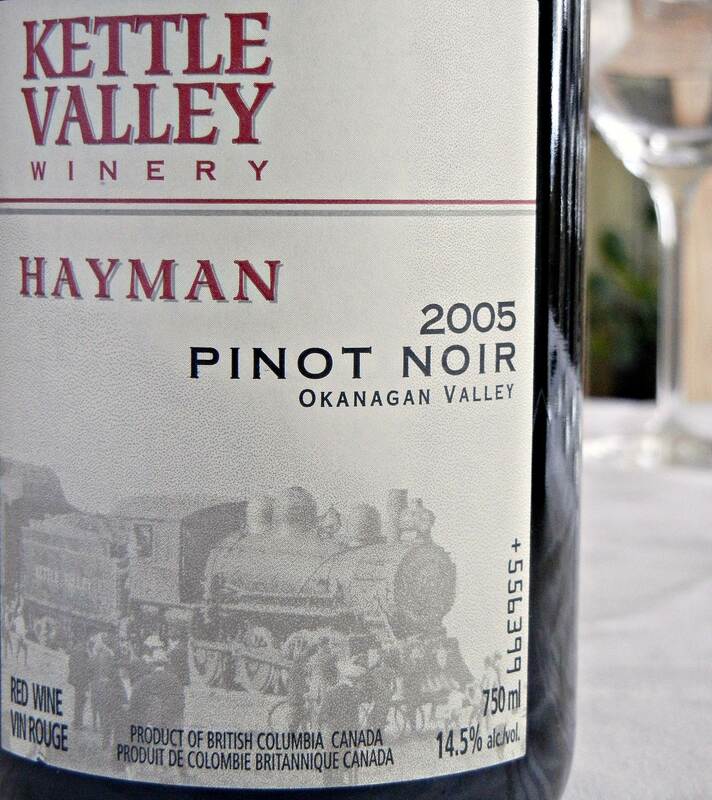 Kettle Valley’s founders planted the Hayman vineyard in Naramata in 1988. This single vineyard wine is also produced from a single pinot noir clone. It is UCD #13, also known as the Martini clone (actually the most widely planted of several Martini clones). At the time Tim and Bob planted it, it was also known as the “Washington clone” because it had been one of the most widely planted pinot noir clones in Washington state in the mid-80’s. This Clone 13 was also widely planted in the Santa Maria AVA in California coming originally from a clonal trial in 1966 by Dr. Harold Olmo and Louis Martini in Carneros. This clone tends to be late ripening and thick skinned. The Hayman vineyard was renamed Hayman John’s Block in 2012 in memory of Vancouver Wine Festival founder John Levine, who was Kettle Valley’s first supporter and who died in 2012. This vintage was slightly unusual in that it was actually a blend of pinot noirs but it was sourced from grapes grown primarily in the Hayman vineyard. The wine was aged in American and French oak for 11 months. Production was 63 cases. LC: Intense dark, ripe fruit, hint of chocolate, tea. BG: Tar/roses, dried cherry. AKG: Menthol, ripe berries, baking spices, cough syrup, tar, salty caramel. EU: Cranberry and cherry dried, potpourri, dried roses leading to dried tomato in time. Jacquelin G: Beetroot mixed with dried fruits and cherries (sour). Lots of fresh cut cedar. LC: Dark cherry, tea, mushroom, medium/long finish. BG: Kirsch, intense cherry, tar/liquorice, reductive. Intensity – medium, soft and after two and a half hours, wood. AKG: Nice mouthfeel, cherries, rather short finish, tobacco. EU: Ripe fresh cranberry, citrus, vanilla, very light oak. Strong tannins but not excessive, pleasant but masks fruit in finish. Light spices in finish. 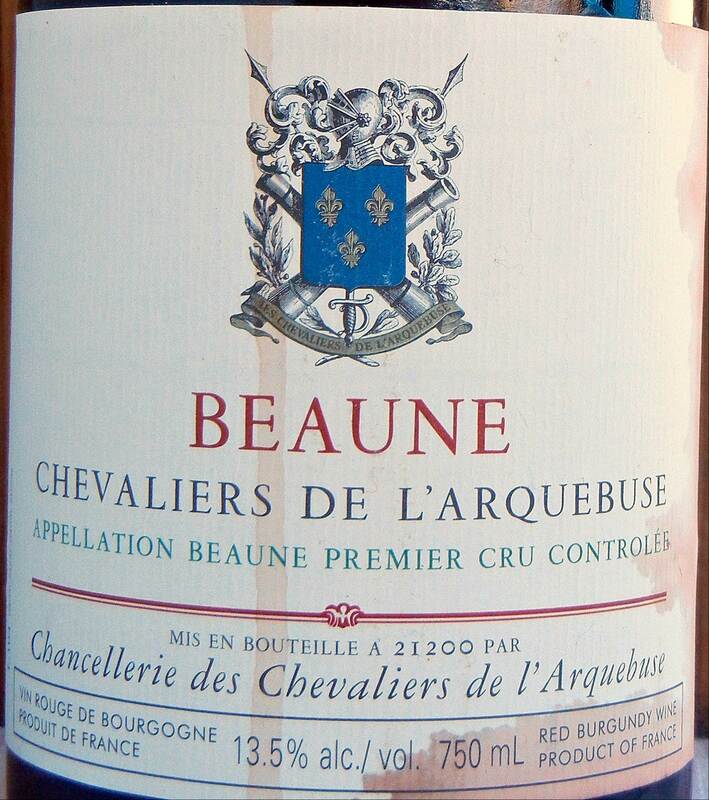 Jacquelin G: Sour cherry dominates the palate and lingers pleasantly in the finish. Refreshing acidity, medium tannins. Grapes for this wine were all from the Hayman Vineyard and were picked Nov 2 at 24.0 Brix. The wine was aged for 21 months on American and French oak. The production was 66 cases. LC: Garnet, light. BG: Pale, bricky throughout. AKG: Pale, bricky – quite glossy and translucent. EU: Ruby, brown edges. Jacquelin G: Light bricky core and rim, bright and clear. LC: Cherry, tobacco, dried geranium, strawberry. BG: Light roses, floral, raspberry, not a lot but soft, silky appealing aroma. AKG: Strawberries, tart lemon? Hint of sandalwood, candy, salty caramel. EU: Horse, complex cherry plum/prune, light floral port. Jacquelin G: Very beetroot, stewed tomatoes, hint of coffee. Perhaps overuse of oak. Savoury herbs. LC: Tobacco, tea, sweet fruit – strawberry, medium long finish. Good balance. BG: Cherry/tar, herbal cherry, bitter/sour ending which stayed. AKG: Strawberries, lovely balance, simple but nice structure, silky mouth feel, complex finish, lemon meringue pie. EU: Light in tannins, strawberry, cranberry, fresh fruit, citrus, sour cherry in a long finish. Jacquelin G: Pleasant savoury fruit (tomatoes) and herbs. Medium plus finish, palate delivers what the bouquet promised. Drinking very well now. The grapes for this wine were sourced from the Foxtrot Vineyard. At the time of this vintage, the vineyard was owned by Carol and Don Munro who planted it in 1994 and 1995 all to clone 115. Gustav Allender purchased the vineyard in 2002 as the foundation for his new winery – Foxtrot Vineyards. The grapes were harvested October 25, 2000 at 24.8 Brix. The wine was aged 21 months in French and American oak. Production was 66 cases. LC: Garnet, dense. BG: Pale, bricky throughout. AKG: Brick, cloudy. EU: Brown garnet. Jacquelin G: Bright and clear, medium dark brick core and rim. LC: Hint of beet? Forest floor, mushroom, black tea. BG: Liquorice, light strawberry, tar, roses. AKG: Wood, plums, baking spices, baked citrus, savoury notes – olives? Tobacco. EU: Old, dried fruit. Jacquelin G: Slightly funky note of rubber, lots of ripe tomatoes, hints of savoury herbs. The rubber note blew off very quickly. LC: Plum/dark cherry. Hints of anise medium/long finish – strawberries at end. BG: Herbal cherry, some earthiness, bitterness. Short, medium bodied, medium intensity. Finish lengthened after open about an hour, beetroot, barrel. AKG: Deep flavour but not overly intense – cherries, pomegranate, blueberries, long finish very mellow. EU: Pleasant vanilla, strawberry, cherry. Distinct but balanced acid and tannins, exotic wood in finish (Rosewood/sandalwood). Jacquelin G: Softer acidity – lots ripe tomatoes, soft ripe tannins, medium long savoury finish. Drinking well now, note needs a few minutes for rubber notes to dissipate. This reserve wine is a blend of grapes from the Hayman, Foxtrot and Spagnuolo vineyards and were picked between October 23 and November 2 at 24.9 Brix. The wine was aged in French and American oak for 16 months. The production for this wine was 110 cases. LC: Garnet. BG: Pale, quite bricky. AKG: Bricky, lighter, glossy. EU: Lighter garnet. Jacquelin G: Bright and clear, medium bricky rim and core. LC: Caramel apple. BG: Very light cherry, strawberry but really not much. AKG: Wet leaves/barnyard, strawberry jam, gasoline, guava. EU: Complex red fruit, herbal. Jacquelin G: Very fruity, lots of stewed tomatoes, hints of tomatoes beets. Savoury herbs. LC: Sweet fruit, sour cherry candied apple/caramel almost overpowers. Medium long finish. Almost burnt note. Candied apple notes did fade after 30 minutes. BG: Dull and flat, a bit bitter, slightly long, some complexity, earthy, mushroom, some barnyard effects. AKG: Strawberries, huckleberries, charcoal, wet leaves. EU: Complex cherry, current, lime, cranberry. Good but strong dry tannins finish. Jacquelin G: Good acidity, slightly green tannins, soft enough to age. Good fruit on palate and finish along with its Cedar. Medium bodied – drinking well now. Could hold for another couple of years. LC: Garnet to brown. BG: Not quite as bright as the others. Dark plum, looks reductive. AKG: Almost brown, slightly opaque. EU: Dark reddish brown. Jacquelin G: Dark bricky core, very cloudy. LC: Anise. BG: Smells a little oxidized. AKG: Sherry, red liquorice, forest floor. EU: Chemical ketone aroma dominant. Jacquelin G: Prunes, stewed tomatoes, caramel, perhaps slightly oxidized. Savoury and gamey notes. LC: Good body. tea, mushroom, dark ripe cherry, longish finish – finishes a bit hot/acidic. Amarone like. BG: May well just be gone. AKG: Sweet, woody, silky texture, longer aftertaste. Very strong flavour with rich tannins. EU: Nice cranberry, strawberry, herbal, horehound. Pleasant but a little old. Jacquelin G: Good balance if perhaps a bit soft on both tannins and acid, savoury finish. Tastes better than it smells. The grapes for this vintage were from the Hayman vineyard and were picked October 31 at 25.8 Brix. The wine was aged in American and French oak for 20 months. The production was 110 cases. LC: Red garnet. BG: Pale, ruby rim. AKG: Cherry/garnet. EU: Dark red. Jacquelin G: Bright and clear, garnet core, light. LC: Plum/bing cherry, bramble – tobacco, quite long finish. BG: Lovely floral, slightly biggish, good acidity, dried cherry, liquorice, tobacco. Quite long. AKG: Big fruit, lots of cherry, strawberry, wet leaves, rich tannins, long flavour, chocolate, vanilla. EU: Cooked red fruit. Light floral on finish. Jacquelin G: Well-balanced, savoury palate. Could hold for two years or more. The grapes for this vintage were from the Hayman vineyard and were picked October 29 at 25.1 Brix. The wine was aged in French oak only for 19 months. The production was 88 cases.